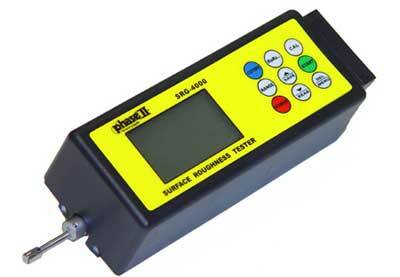 The latest in state-of-the-art surface roughness testers, the SRG-4000 is designed with the shop environment in mind. These surface roughness testers are distinguished by a high level of accuracy, multiple parameters and simplicity of operation. 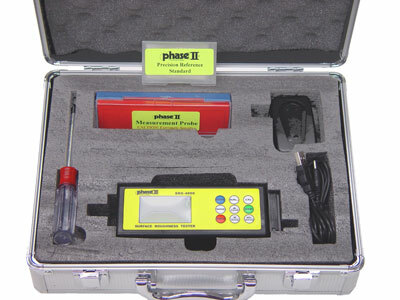 Extremely sensitive and highly accurate readings from this Phase II surface roughness tester are offered via multiple surface roughness parameters, Ra, Rq(Rms), Rt and Rz. The diamond stylus is hypersensitive and sophisticated enough to allow for a .001 (um) micron display resolution. The SRG-4000 surface roughness testers utilize an easy interface to allow for changes of in/mm (uin/um), cutoff length, sampling length, parameters, level of test(stylus position), digital filters and more! Measurement results are displayed as large characters on the LCD screen for easy recognition. Battery powered portability allows the SRG-4000 surface roughness testers to mobilize productivity throughout the shop. The PHASE II SRG-4000 Roughness Tester comes complete with a compact durable carrying case, roughness standard, and instruction manual.